5 April 2018 nestling great horned owl from Polk County. 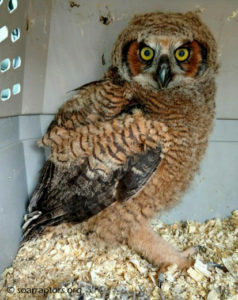 SOAR has already admitted several young great horned owls this spring! Yes, it is always best if the raptor parent(s) raise their young. Knowing when to intervene is difficult. Nestling or hatchling – rely 100% on parents to feed them, will still be covered in down, some feather growth, and are not able to regulate their temperature. A raptor this age also cannot tear their food. If a nestling is no longer in (or near) the nest… it will not get fed. 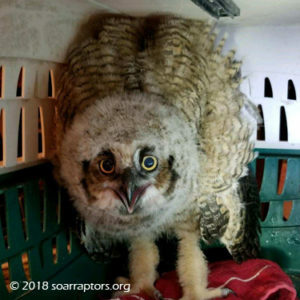 Brancher – a young raptor that has lost their down, is mostly feathered, has left the nest but has not gone far and still relies on adults to bring food. Fledgling – fully feathered, starting to fly and still relies on adults to bring food. Eventually will start making attempts to hunt on own and will do so with increasing success. Juvenile – an independent bird that does not yet have adult feathers / plumage. Spring storms, tree removal, other weather events (high winds, heat), and even bugs cause birds, particularly nestlings, to be displaced from the nest. If you find a young raptor on the ground that looks similar to this young screech owl in development… keep the baby safe from predators (an upside down laundry basket works well) and then search for adults in trees, an exposed nest, other young on the ground. A young bird of this developmental age will not get fed when on the ground and needs to get back to the original nest or a make-shift nest if at all possible. 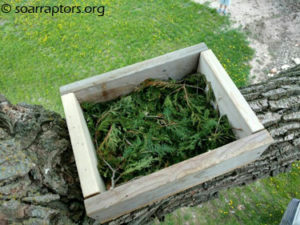 Even young raptors at the brancher stage of development should, for their own safety, be in the nest tree. If you see adults or if you see the nest AND can safely get the young back in the nest or back in a make shift nest (there is a reason to save the wicker baskets from the florist, take out any plastic liner and put in some soft bedding) that can be secured in the tree… please do so. Also keep watch to make sure the adults have found their young again and are feeding. SOAR fields many calls about downed baby birds, as do our partners in conservation — county conservation boards and Iowa DNR staff! One county naturalist we know has two or three calls a day during ‘baby season.’ Sometimes these calls end in a patient admit while other times the family is reunited. Our volunteer Tyler helped a landowner in Woodbury County build a ‘nest,’ for a brancher GHO that was on the ground. Tyler asked the landowner to call him if anything was amiss again and hearing nothing, we assume all is well! Thanks to the landowner for the quick action! The Cass County Naturalist helped one of her volunteers encourage three brancher to not-quite-brancher barred owls to move to a barn near their nest tree. Storms the night before had displaced the young. One was just starting to make short flight attempts, likely the one in the photo. Inside the barn, the young barred owls were able to hop and flap up to a window in the peak of the barn. From there it was a short flight to the nest still in the oak tree. 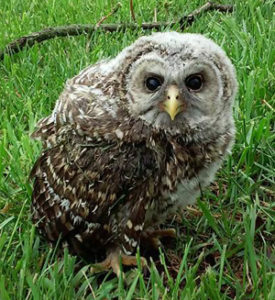 The next morning, the landowner reported an adult and two young barred owls still in the nest. They are not sure what happened to the third one. These owls were lucky to have an attentive adult owl and landowner! 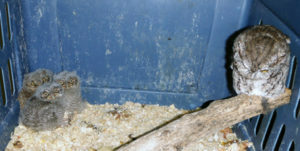 Adult screech owl, right, with young screech owls on the floor of the crate. 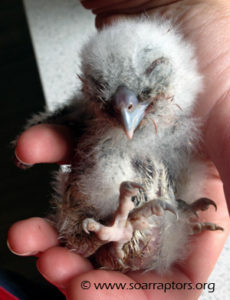 Why is it so important to get the young raptor back in the nest or to a wildlife rehabilitator? Young birds have a ‘window of opportunity’ to imprint on the adults (there is some debate whether there is just one time frame to imprint or if multiple opportunities). If the family cannot be reunited safely or at all, we would rather see something like this adult screech owl with foster children or the young raptor in a crate across an aisle from another or in the same flight room with the same species… than a very young raptor left on the ground to fend for itself (where it would not survive). If that young raptor doesn’t imprint on an adult like them, then that bird may not grow up knowing that it is a specific hawk, owl, falcon. When this happens, SOAR cannot release these birds back to the wild because they do not know how to be a social member of their species. Read about two or our current education ambassadors that are human imprints: Bella and Blaze. If you ever have questions or if you do see a young bird on the ground, read this PDF from the National Wildlife Rehabilitators first (it ‘feels’ like a flow-chart for songbirds, but is useful for raptors, too), when it says to call a wildlife rehabilitator, call SOAR at (712) 830-6116 and we’ll help process your situation, and if need be, get in touch with the nearest rehabilitator.